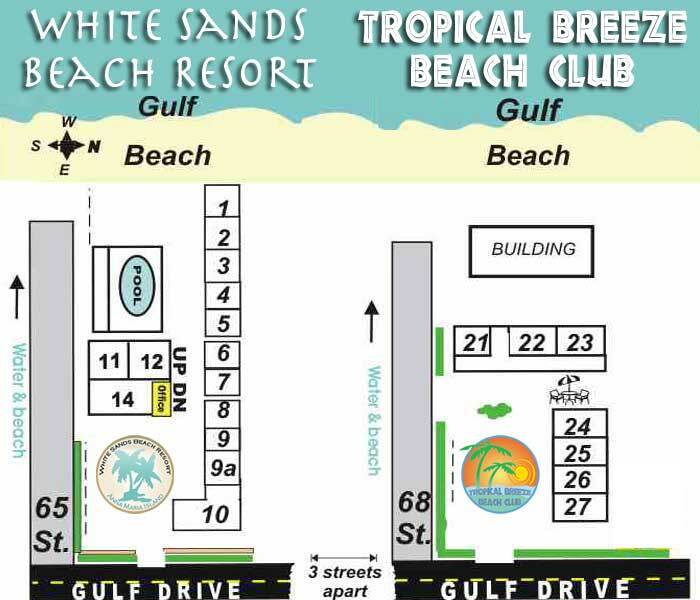 Visit Tropical Breeze Beach Club or White Sands Beach Resort, located on the Beautiful Beaches of Anna Maria Island, famous for White Sandy Beaches and Crystal Clear Water. White Sands is a True Florida Vacation Get-a-way! Tripadvisor Ranked Anna Maria Island, Florida 4th in U.S. Island Vacation Destinations! White Sands offers charming one & two bedroom Florida island style apartments, and studios, and at Tropical Breeze beach Club we offer cottages & motel rooms. More than just a motel hotel, All rooms have fully equipped kitchens, have 42 inch LCD TV's , playstation2 and DVD/VCR at our Florida beach resort. While on vacation you can enjoy a gulf front heated pool, shuffleboard court, picnic areas and bar-b-q grills. Nearby are tennis courts, island beach shops, golf courses & a number of award winning restaurants like Beach Bistro and Sand Bar. Between Tropical Breeze Beach Club, and White Sands Beach Resort, we have a total of twenty-one Florida resort units on the gulf with kitchen and phone, & heated pool on the beach. No pets. Our island resorts are located on the west coast of Florida just south of Tampa and is a great island vacation place for family vacations and Honeymoon vacations.